Special Containment Procedures: The remains of SCP-1470 have been laid to rest in a small plastic case within the podium section of its terrarium, see below. The terrarium is to remain stocked with salticids and the offspring of SCP-1470, and observed. Pending the end of quarantine period, these offspring may be introduced into the wild if no anomalous behavior is detected. All personnel have been cleared of quarantine after exposure to SCP-1470 with no ill effects. Previous containment procedures, ended May 7th 2008: SCP-1470 is housed in a sound-proofed terrarium measuring 0.75 meters by 2 meters, 0.60 meters tall. The terrarium includes a small source of fresh running water and includes flora common to the Australian state of Queensland. The northeastern corner of the terrarium has been modified to allow for communication with SCP-1470. This location is referred to as the "podium." SCP-1470 appreciates regular social contact and is scheduled for interviews three times daily, allowing for a regular nocturnal sleep schedule. If personnel wish to conduct an unscheduled interview with SCP-1470 for any reason, they may do so by entering the chamber and vocalizing their intent to speak with SCP-1470, which will enter the podium or respond as it is able. It is not necessary to speak verbally when communicating with SCP-1470, but vocalization of words helps to convey meaning more clearly than thinking of abstract concepts and allows for easier transcription of communication. SCP-1470 is not capable of understanding the full range of human thought, so it is highly recommended that researchers only use basic concepts and short statements. SCP-1470's terrarium should be stocked with a monitored population of mundane salticids, web-building spiders, and their own prey insects to serve as prey for SCP-1470. The best way to distinguish SCP-1470 from other salticids within the terrarium is to ask it to wave its arms. Personnel working with SCP-1470 must report for psychological screening on a weekly basis, for a period no less than a year after exposure. Description: SCP-1470 was a male fringed jumping spider (Portia fimbriata) recovered from Queensland, Australia. Its body measures 6.3 millimeters. In life SCP-1470 was sapient and capable of telepathic communication with other sapient beings at a range of approximately nine meters, although SCP-1470 was otherwise not notably different from other members of its species in behavior or physiology. 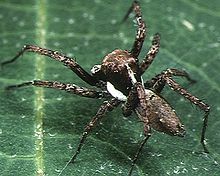 The Queensland population of P. fimbriata has already been observed to be more intelligent than other spiders in its ability to solve problems and employ unique hunting tactics to capture its prey, which primarily consists of other spiders, both of the web-spinning varieties and other members of the Salticidae family to which they belong. Apart from its ability to communicate with research personnel, SCP-1470 displayed no behavior that was deviant from what is typical of the Queensland variant of P. fimbriata. However, due to its anomalous ability to communicate, it is not recommended that any conclusions about the species be drawn based on the experiences of SCP-1470. Communication: SCP-1470's method of telepathic broadcast appears to assign terms on a "best-fit" basis within the minds which receive its communications. When SCP-1470 referred to parts of its own body which do not directly correspond to human anatomy the terms are adjusted based on content. For example, while "leg" is a straightforward translation, references to SCP-1470's palp were typically perceived as "arm" by researchers. "I went at the bloody harlot waving me arms around to let her know what's what but she wasn't having none of it. She smacked her lips at me and gave me a good drumming with her arms and legs, and I know it was because of that hideous red stripe you asked to put on me arse, it really makes a fellow stand out in ways he's not supposed to, you know? Those savages might not notice it much but you can't fool a proper lady. So anyway I had to tie a bungie and make a jump for it, before sailing back to me tent to nurse me pride." As is typical of statements made by SCP-1470, it was perceived in a way that could almost be spoken by another human (it was also typical to perceive these statements in a strong regional dialect). Note, however, that "harlot" is used as a derogatory term and does not imply prostitution, a concept alien to P. fimbriati. "Lips" refers to the chelicerae, where a spider's fangs are stored. "Arms" refers to the palps bordering the mouth, which are larger in males and used for display purposes; in this case, they were used to make the female aware of SCP-1470's presence and lack of intent to harm her. "Arse" refers to abdomen, and the red stripe that was painted there at one time to distinguish SCP-1470 from other spiders. "Tie a bungie" refers to laying down a safety line of silk before making a jump off of the surface the spiders were located on, and "sailing" is a straightforward description of drifting down on a loose strand of silk while airborne. Likewise, "tent" refers to SCP-1470's web, a structure used purely for shelter. SCP-1470: Hey, not so loud, mate, you'll wake the little sheila. Dr. Westington: Your interaction with her seemed to go better. How is she doing? SCP-1470: She was pretty scared when she got tossed out here by those big predators. At least I think she was, she can't talk to me like we can talk. None of them ever can. But she shows me she cares in her own way, she asked me back to her place and we're going to stay there until she's ready. Dr. Westington: Ready for what? SCP-1470: You know! Can't be a gentleman if we talk about it so plainly, you know? Not the way you guys do. Anyway, I guess I should say thank you. It's not what I wanted, but it will do. Dr. Westington: You told me you wanted a mate. SCP-1470: I told you I wanted a wife. A mate is a friend, we're mates, right? You're fun to talk to but I wanted… someone I could look in the eyes while I talked to them. Dr. Westington: We've never found anyone else that can talk like you do. SCP-1470: Well, it's what separates us from the savages, right? Dr. Westington: You mean your prey species? SCP-1470: Right, right. You're different from them, because you can talk like I do. I would never eat something that could talk. She can't talk, but… I can tell she's like me. She just needs to grow up some. That will be very soon. She'll probably catch more savages than me, too. We'll have good children, if that big old harlot keeps her distance. Dr. Westington: We removed her from the area. SCP-1470: I hope you didn't hurt her. Note that cohabitation in the same web between a male and a sexually immature female is not uncommon in P. fimbriata. The female's maturity was reached within the next two weeks and SCP-1470 left the web after copulating. As is normal for the species, the female did not devour or kill SCP-1470. SCP-1470: Hey, is anyone out there? Dr. Westington: Hello, I'm here. We were just doing some work on your enclosure. SCP-1470: What, the podium? It's enclosed but I don't see you in here. Dr. Westington: I am outside your podium. SCP-1470: The podium doesn't have an outside, you daft bint! How come I can't get outside it? Dr. Westington: Do you see me waving my arm at you? Dr. Westington: I will not hurt you. We like talking with you and we want you to live. SCP-1470: I never realized you were so big. How could anything be so big. SCP-1470: I'm sorry. I just thought we were like each other, but that you just wanted to stay hidden because I'm kind of the king of the jungle around here. At least I thought I was. Dr. Westington: Maybe I should have. We've tried hard not to alarm you. Dr. Westington: I don't have any answers to that which will make sense to you, but I understand you were scared. I've been scared too, by things that are as big to me as I am to you. If that hurts to think about, I understand that too. SCP-1470: The children won't talk to me. But the ones that lived are doing alright. I guess that isn't important to something like you though. Dr. Westington: It will be my job to watch them. We were hoping they could talk like you do. SCP-1470: Hah! You and me both. I'm pretty tired and itchy now. Want to change my coat but I can't. Sorry for getting all weird on you earlier. I just wanted you to know that it was nice to talk to someone while it lasted. Note from Dr. Westington: SCP-1470 lived for a total of three months in Foundation custody before perishing of natural causes. He was not fully mature at the time of containment, so his total lifespan was estimated to be approximately four months.